I’m sick of listening to developers trying to create marketing alternatives to LoopNet tell me about the astoundingly messy state of agent and brokerage listing management. Paper files, multiple spreadsheets, PDFs only! This lack of organization not only hampers new marketing opportunities for your listings but it’s often the nail in the coffin for a start-up who can’t get agents to contribute due to manual entry overload. You want change? You want alternatives? You want more online exposure for your listings? There’s only one way to stop the madness. If you don’t already keep your brokerage’s listings in a database or spreadsheet, you have to start now. And if you do, it’s time to demand aggregators take your listings in bulk. 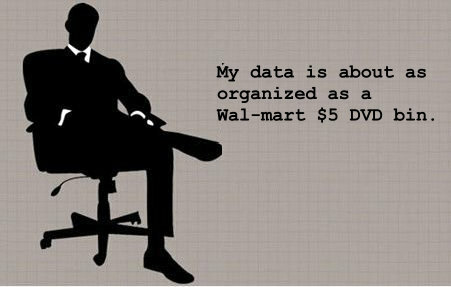 You’ve got the data and if they want it, they had better make it easy for you to give it to them. Luckily, several aggregators are already willing to take Excel files of your listing data and newer aggregators will even take XML files (RSS feeds). Even LoopNet will sometimes take Excel files if you’re a LoopLink customer. But in all cases, you need to be prepared to send them something useful. Since aggregators keep listing data in a database, they’ve got a set of pre-defined fields they want you to fill. Not that you have to give them everything they want. There are usually some required fields like address and contact information but other than those, they really will take what they can get. Organization on your part is the key. 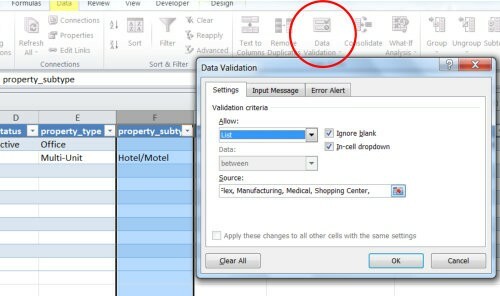 Your data must be in defined columns in either database tables or a spreadsheet. In other words, you can’t jam everything into a few columns or cells. Sometimes the aggregator will provide you with a sample spreadsheet but often, they’ll take what you have and map it to their fields. It could be just a matter of matching your Excel column title (e.g., Suite) to their database field name (e.g., Ste). Or you may store the address as street number and street name and they want the street address on one line. –For the address, you enter the number in one column, street name in another and the full address (number and name) will appear in the next column, “full address” via Excel’s concatenate function. –The address has also been split up to guard against street name “variations.” As you type in Excel, it will try to “guess” what you’re typing by searching through text already in the column. So if you’ve already typed in “Main Street, once you type in “Ma…” matching text will appear for you to select. –Some of the columns like status and property type have drop-down lists so that people entering data don’t have to type the same thing over and over again (or miss-spell it…). –For one column, listing number, I used Excel’s auto-fill function to automatically assign each listing a unique number (a really good idea….and don’t delete any rows/re-use a number). Delete these if you don’t want them or to create your own, enter your listing numbers in the first two cells (1,2…) then use the auto-fill feature to fill in the rest of the column. –The property ID column may have non-unique values. If you’ve got your data in a relational database – or you get property data from a specific source – you should use this ID. That way, the aggregator can more easily identify single properties and group listings with them. –For images and flyers, you’ll need a URL from which the aggregator can download the files. If you use DropBox or another cloud storage service to store images/flyers, put the “sharing” URL in your columns. Or, if the files are already available on a website, right click the image(s), flyer links, etc… to get the URL. Don’t want to use the spreadsheet I’m providing? Check if one of the aggregators you currently use will let you export your listing data. Use that to start and add columns for more data you may want to keep or data that wasn’t exported. When it comes time to send it to an aggregator, sort your listings by criteria like “exclusive” and/or “active” status to select the listings you want to send. Then, select all the filtered rows, copy then paste to a new sheet in a new workbook. Send the new file to the aggregator or provide a link for them to download it. Don’t forget to ask the aggregator how often they update (weekly at the very least), what they do with expired listings (they should get rid of them) and how they allow for emergency listing updates (individual agent accounts or an admin account for manual changes or will they take a new file/make updates right away). And by the way – if you don’t like their answers, don’t send them your listings. It’s time aggregators got a little more organized themselves. Yes! And has to be simpler than the OSCRE one – that one’s a nightmare… KISS!